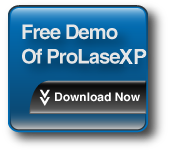 The most popular product laser software product is ProLase for Windows. This high-end laser marking software system is richly featured, loaded with advanced capabilities, including importation of many vector and bitmap graphics formats, finely tunable bar code formats including ID Matrix 2-D codes, precise vector hatch fill for graphics and True Type fonts, tool path optimization, and a large variety of configurable drivers for various laser/galvanometer configurations to name just a few. ProLase7 is the newest member of the ProLase family. It maintains the look and feel of our popular ProLase user interface, but has a whole new engine under the hood. Specifically designed kernel mode drivers allow ProLase7 to support all of the hardware configurations offered in previous versions of ProLase, while running natively in the current Microsoft operating systems (Windows7). ProLase7 will also run under Windows 95/98/ME/2000/XP. And of course, our policy of continually improving our product and adding new features continues with ProLase7. Amongst the latest features added are goodies such as "Rich Text Objects" and an improved graphic aquisition method. This new method is righly reliable, version independent, and greatly simplies getting vecter graphics into ProLase. ProLase RTC operates only with the SCANLAB RTC interface. Please note that this is the only driver interface supported by ProLase RTC. Other versions of ProLase support all interfaces, including RTC and direct galvo control. ProLase 95 is an older version of our current product, ProLaseXP. Please note that ProLase 95 runs only under Windows 95/98/ME. It will not function under Windows NT/2000/XP. At this time, no new features are being added to ProLase 95, though we will continue to support it for our customers. ProLase is the most advanced laser marking software available today. Among its many features are ease-of-use, high performance, flexibility, and low cost that give you the best laser marking software on the market today. Designed to be both a retro-fit package and the original software on new machines, ProLase can support a large variety of galvanometric hardware configurations, including most existing laser marking systems, marking heads and lasers. ProLase has all the features that you should demand in quality laser engraving software! Galvo Interface ProLase supports direct Analog and Digital control of galvanometers, as well as ScanLab helper cards. Laser Interface Any type of marking laser can be controlled and calibrated. Virtually any marking application can operate with ProLase. User Interface The ProLase user interface focuses on the richness of its feature set while remaining intuitive and easy to learn. Object Types Vector graphics, bitmap graphics, bar codes, serial text, external input, drilling, and micro-machining and more! Mark Field Control High-speed motion control system that can be customized to fit the galvanometric and optical situation of any marker. Parts Handler Digital input and output that can be configured for interlock detection, start mark, aborts, process synchronization, conditional marking, and more! ProLase Plus ProLase Plus adds 4 external axis controls that can run stepper or servo motor systems. Mark areas larger than the laser field, even wrap text around a cylinder! ProLase Toolkit and ProLase Server If our user interface isn't what you need, then use ProLase as the back-end for your own custom application. Access all the power of ProLase through either an extension DLL interface or through a COM Automation server. Prolase is a powerful, user-friendly industrial software program designed for use with most laser marking systems including Nd:YAG, Fiber and CO2.